Our average has been in the 70 to 75 families range. The above increase is quite a jump and over the last six months our average has gone up to 85 families per month. Thankfully our God has given us guidance, and brought us to Feeding America. We are blessed to be able to work with these families and privileged to be servants of God. The Mission Committee invites you to visit us on a Monday or Saturday that works with your schedule. We would like to show you our food truck, our volunteers, guests and the amount of food that we purchase with your offering. You might want to visit Mrs. Cathy and the food truck kids downstairs and join our story time. You are our support and we could not do this without you. We thank you for your prayers and funding, and we pray for all of you. 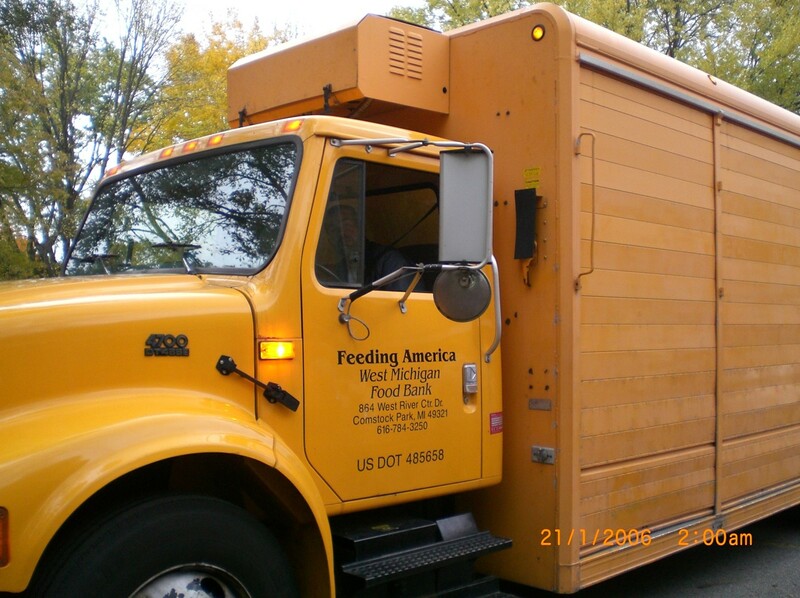 South UMC Food Truck ministry began the spring/summer of 1999, when a representative from 2nd Harvest Gleaners, now known as Feeding America, contacted our church and told us about their outreach program to fight hunger in West Michigan. For over 16 years our congregation, through prayer, volunteering and offerings, has supported this outreach. It has grown, not just the number of families we serve every month, but additional ministries that have been added such as a youth program with playtime, Bible story, crafts, and a snack, a clothing distribution program in the winter and our Prayer Circle where joys and concerns are shared with our guests. We are ministering to many children each month at the food truck. The children seem to enjoy being there doing crafts, hearing stories, singing songs and receiving a small treat along with juice and/or hot chocolate. We have many children that come downstairs each month and we enjoy ministering to them. Stop down and check us out! This is a wonderful outreach mission that is very much appreciated by the people in our area that frequent the food trucks. The food trucks cost our church $495 per month and this cost is not in the church budget so we depend on your generosity and donations for this service to our neighbors. We also serve hot coffee or juice to those folks in the food line. Please stop by for a visit when you are in the neighborhood.